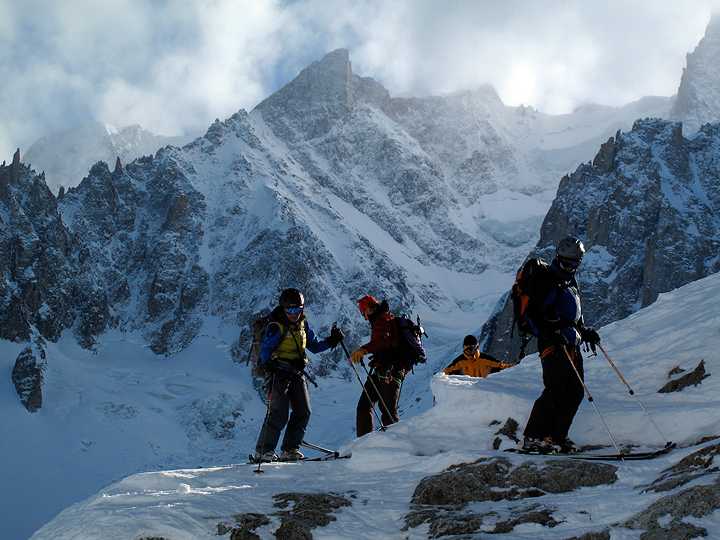 Andy Landes and Geoff Alexander, who spend altogether too much time at Sugarloaf Mountain in Maine, made a quick visit to Chamonix of some off-piste skiing. For better or for worse, the northern Alps have been in the middle of a draught for at least a couple weeks, and there was little powder to be found. 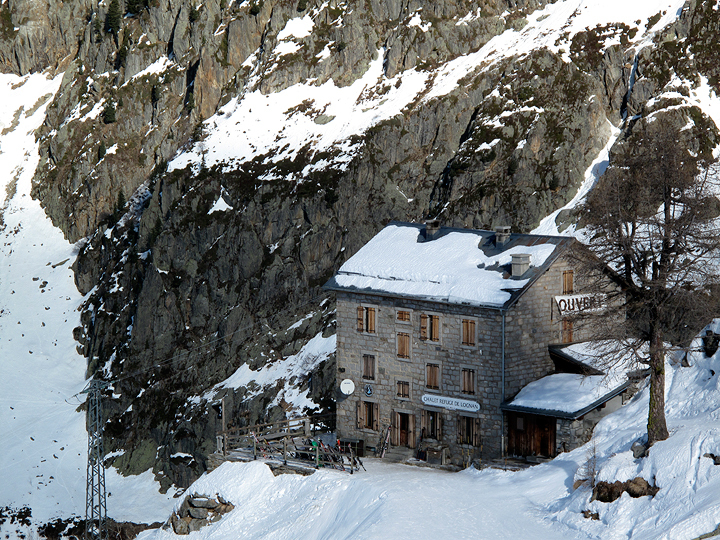 However, the skiing was still great, and the fine weather only helped to show off the scenery. 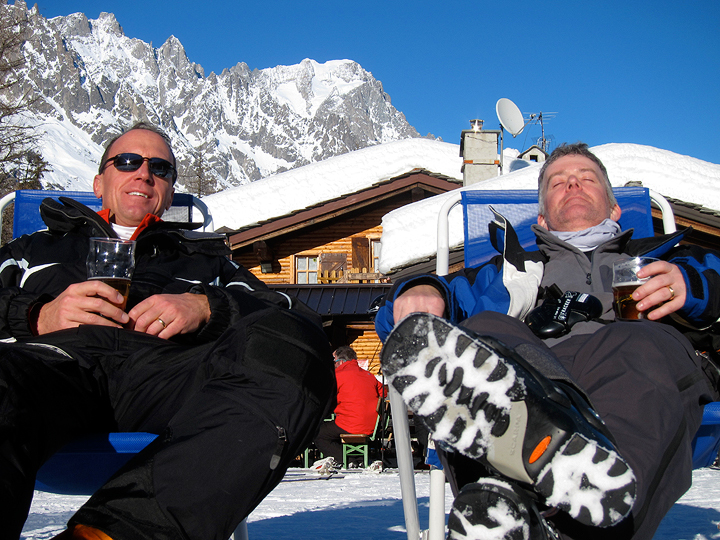 We started with a day of off-piste a the Grands Montets. 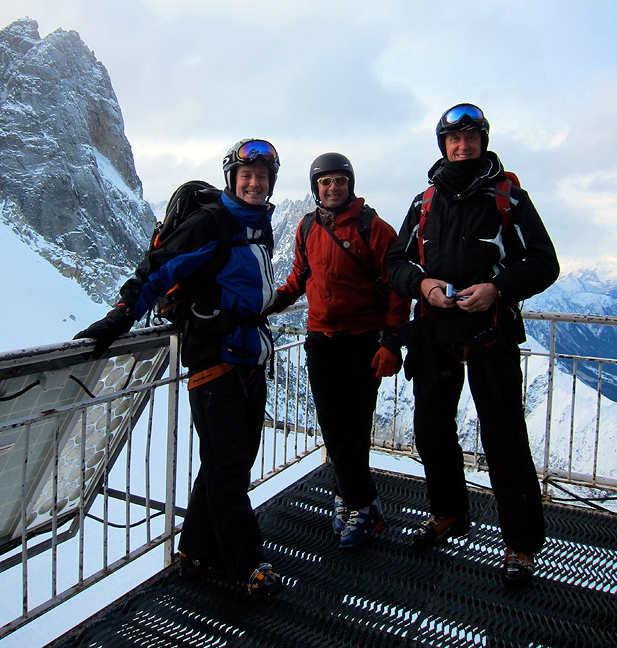 Andy on the left, Mark in the middle and Geoff on the right, at the top of the Grandes Montets. 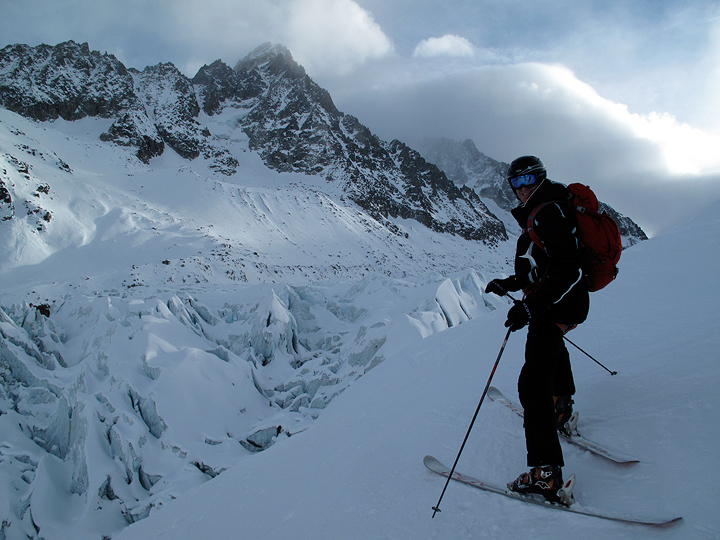 Geoff stops to admire the icefall of the Argentière Glacier. 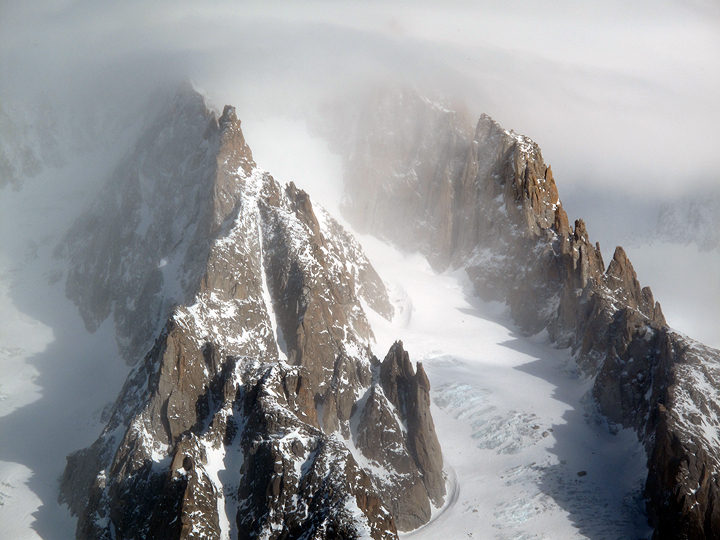 Looking across at the Aiguille d'Argentière, its summit in cloud. 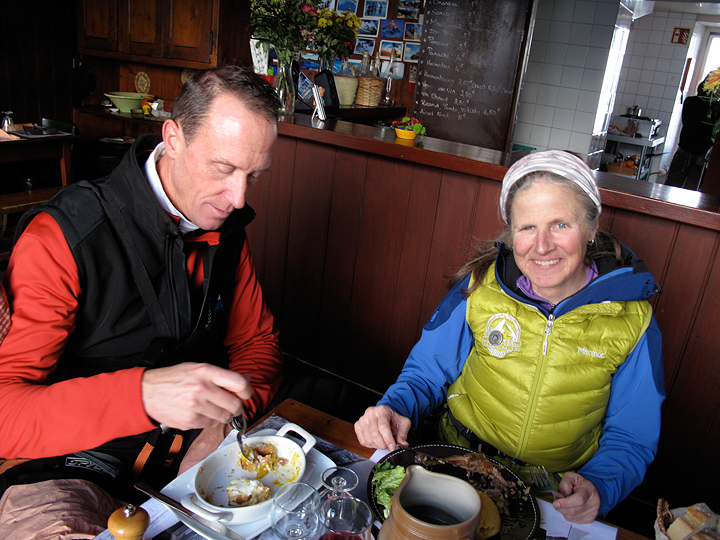 We stopped for lunch at the Chalet Refuge du Lognan, a classic and rustic slope-side hut and restaurant. Geoff and Kathy digging in. 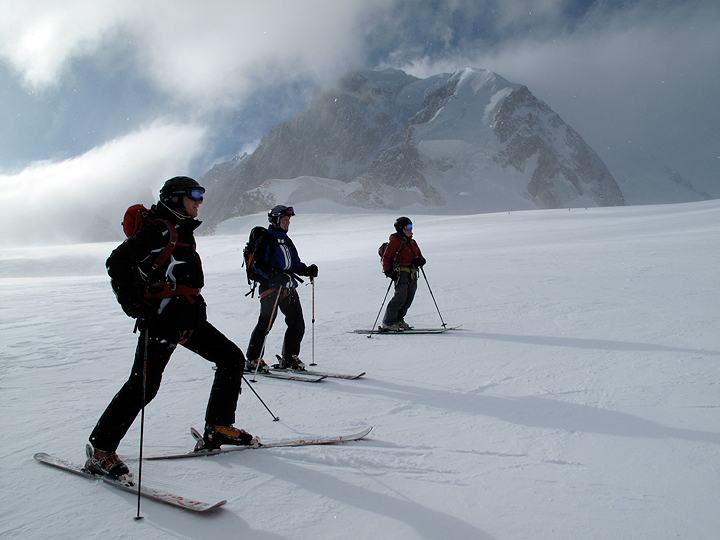 On our second day, we chose the Vallée Blanche. 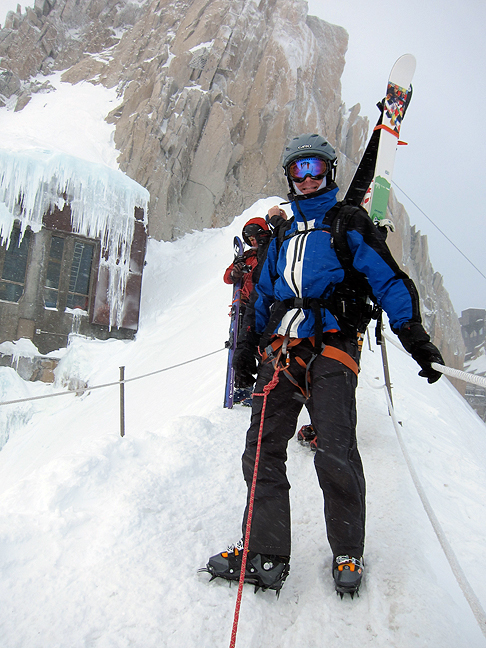 Though the summit of the Aiguille du Midi was in and out of cloud, views were still amazing. Another party takes a scenic bypass. Looking back towards the Classique route. Wind and cloud pouring over the Franco-Italian border behind. 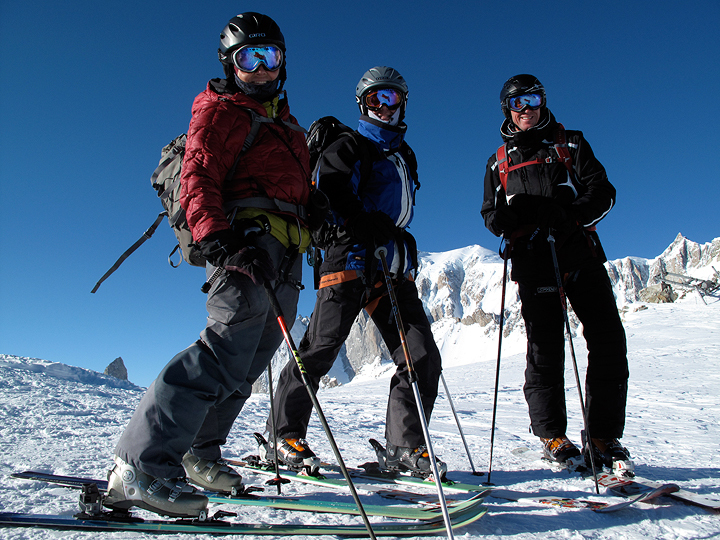 We found a clear highway of very skiable snow in the shadow of the Petit Rognon. 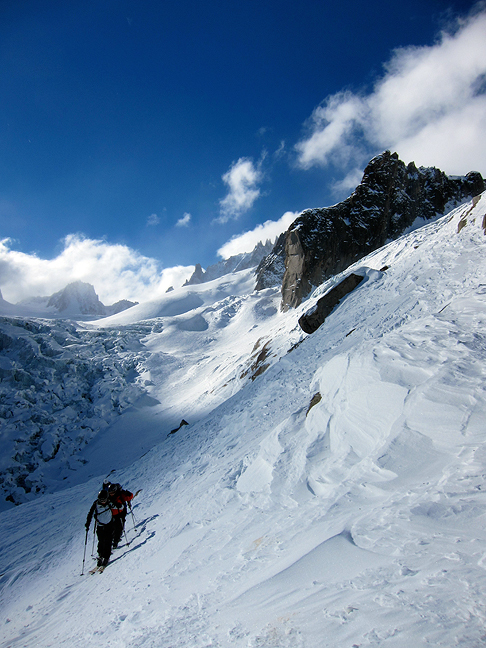 Traversing over to the Requin hut. 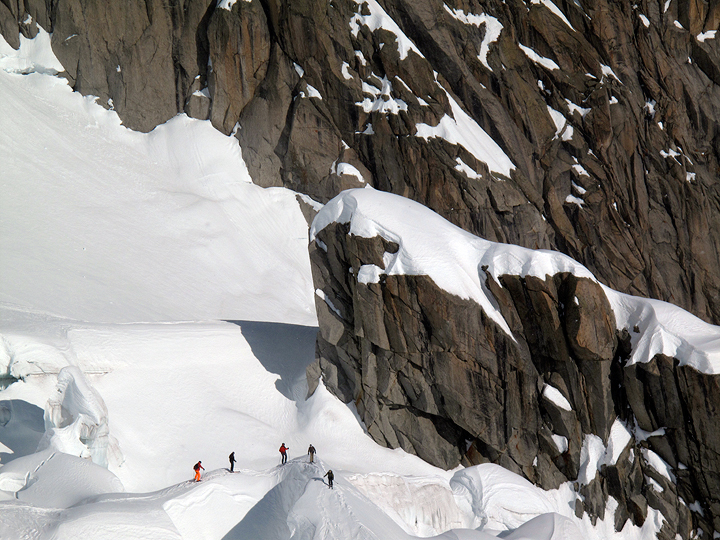 Just past the hut, we encounter a bit of rock as we continue our descent. 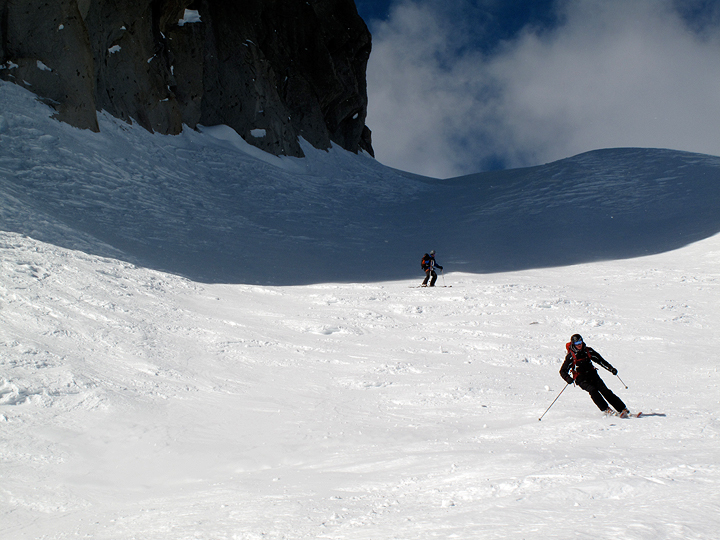 Great snow in the Requin gullies. 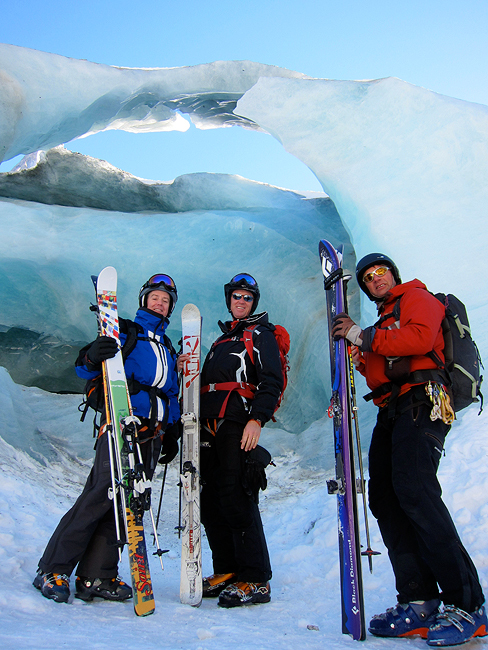 Andy, Geoff and Mark and the exit of the Mer de Glace. 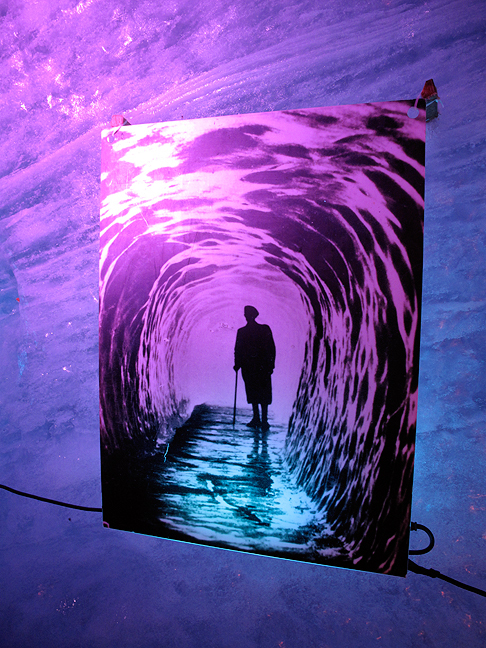 Of course, we had to make a visit to the ice grotto. 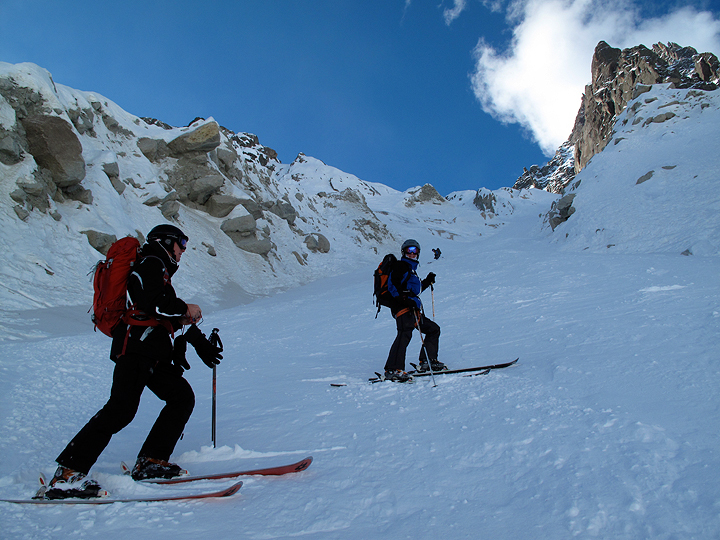 On our third day, we drove though the Tunnel du Mont Blanc, to ski in Courmayeur, Italy. 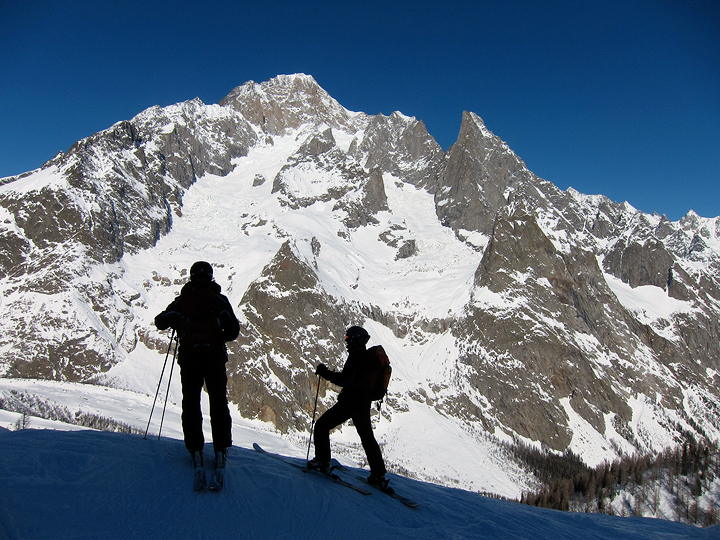 This view shows the south side of Mont Blanc. 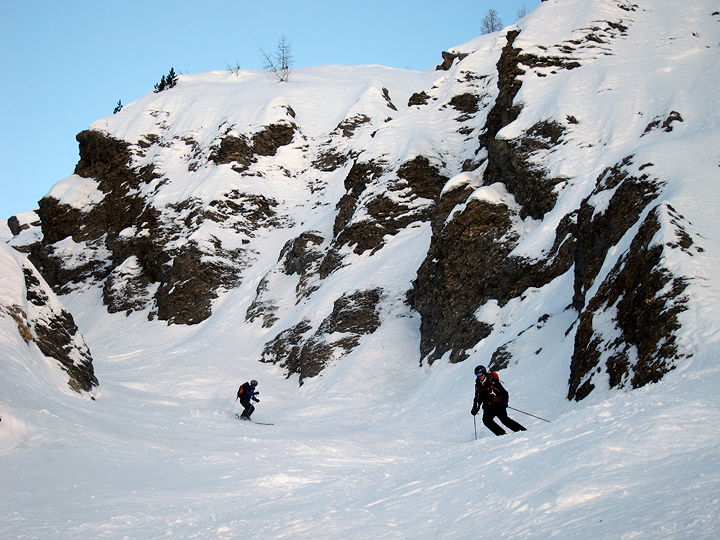 We enjoyed quite good snow in the off-piste gullies leading down to the Val Veni. ...and earned a well-deserved beer. 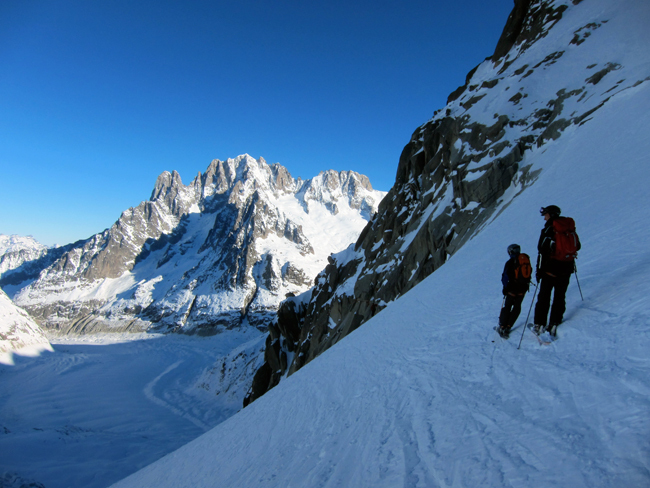 For our last day, we decided to take another route down the Vallée Blanche, this one starting from Point Helbronner on the Italian border. 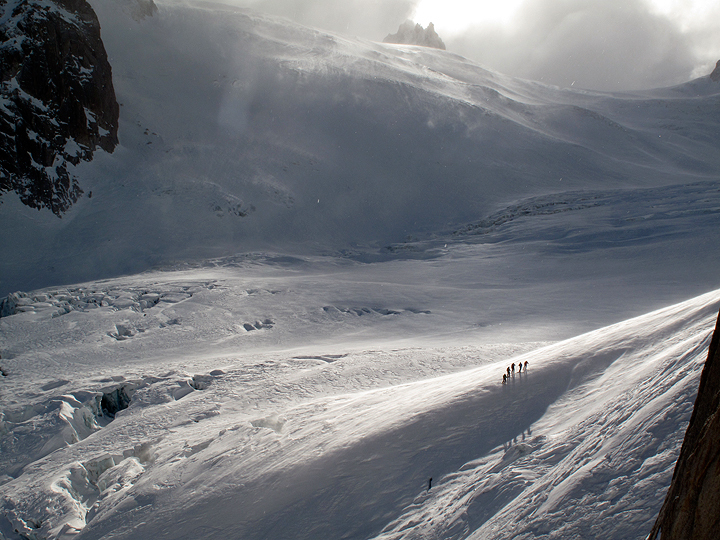 Coming down the Vallée Noir, as it is often called. 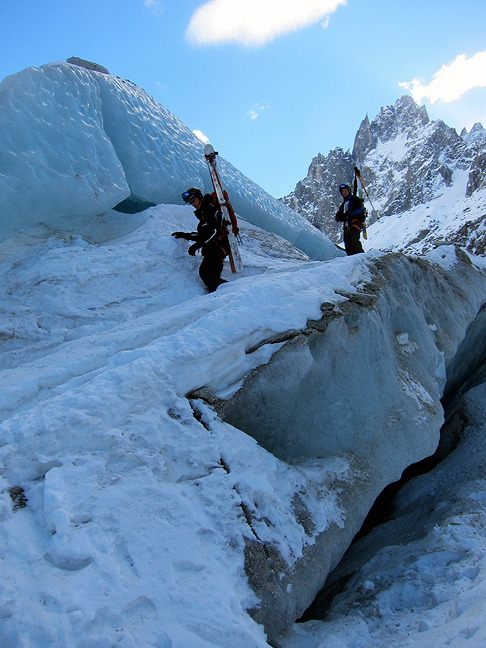 On the Mer de Glace, we stopped to admire the big moulin in mid-glacier. 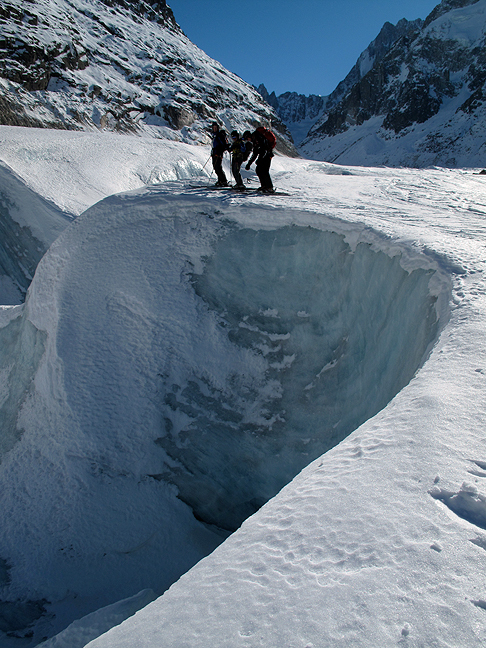 And once again, stopping off the glacier at Montenvers.